A pile of squeaky green beans dressed with lemon, olive oil and garlic is my idea of heaven on a plate. 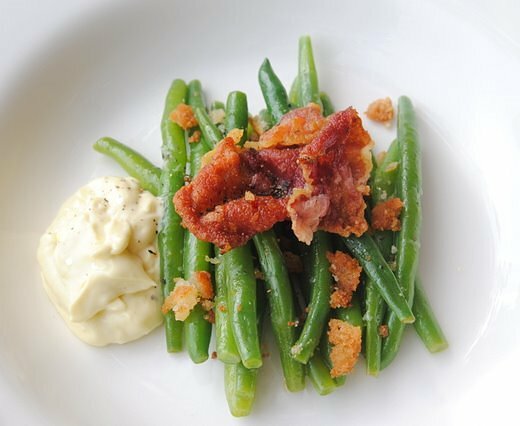 In this recipe, I've added a luxurious touch to the beans by topping them off with crunchy fried prosciutto, breadcrumbs and a flurry of pungent, garlicky home-made aïoli. 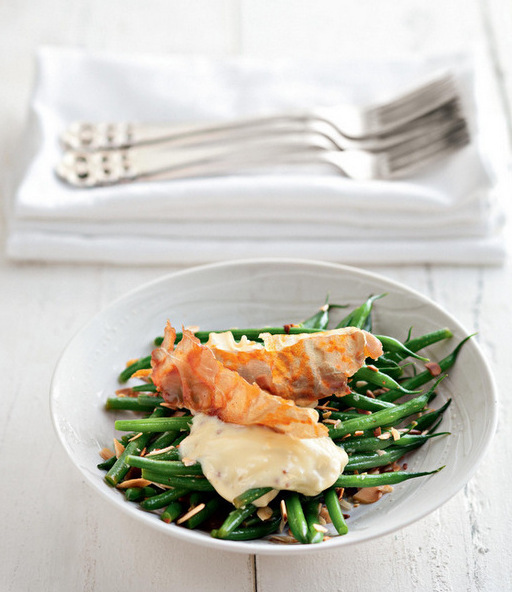 Michael Le Grange's photograph of my Lemony Green Beans with Aïoli. In this version of the recipe, from my cookbook, I added toasted, flaked almonds. Image © Random House Struik 2012. Bowl by David Walters. As I mentioned in my previous post (Dill Baby Potatoes with Smoked-Salmon Mayonnaise) I'm a great fan of dishes that take a small quantity of a luxurious ingredient and spread it between many portions, and this is such a dish. Top-quality Italian prosciutto is very expensive, but you need only six large slices (although of course you are free to add more, if you're throwing caution to the wind). Here, I've used Richard Bosman's excellent locally cured prosciutto, which is available in selected delis and other outlets in Cape Town. I know it may seem like heresy to fry prosciutto, but it is so splendidly crisp and flavoursome prepared this way that every time I taste it I want to fall into a dead faint. Although authentic aïoli calls for olive oil only, I use a mixture of good fruity olive oil and sunflower oil for a lighter mayonnaise. Feel free to add more garlic, if you want your mayo to deliver a good punch in the nose. You can serve these beans piping hot or at room temperature. If you're not serving them hot, don't omit the step of plunging them into iced water to set the colour. First make the aïoli. Put the two egg yolks into a small bowl (a ceramic soup bowl is ideal) and add the salt and mustard. Mix the vegetable oil and olive oil in a small jug with a sharp pouring nozzle. Place a damp cloth underneath the soup bowl so that it doesn't skid around while you're making the mayo. Using a rotary beater (electic whisk) beat the egg yolks and salt for a minute. If you don't have such a gadget, use an ordinary wire whisk, and plenty of elbow power. Now, as you whisk the egg yolks with one hand, pick up the jug of oil with the other, and dribble a little splash of oil onto the yolks. Keep whisking and dribbling, a little splash at a time, with great energy, and within a few minutes you will see the egg mixture begin to thicken rather dramatically. Keep adding the oil, a dribble at a time, until you have a thick yellow ointment. You may not need to add all the oil: stop adding oil once the mayonnaise has thickened to your liking. Stir in the lemon juice, garlic and pepper, and add more salt if necessary. Set aside. Drain the beans. If you're not serving this piping hot, immediately plunge them into the ice water. Leave in the water for three minutes, then drain and pat dry. In the meantime, prepare the toppings. Heat sunflower oil, to a depth of a millimetre, in a frying pan. When hot, but not smoking, add the prosciutto slices, a few at a time, and cook for a minute or so, or until frizzled and crisp. Drain on a piece of kitchen paper. Now crumble the breadcrumbs into the hot oil and fry until crisp and golden (remember that they will carry on browning once you remove them from the heat, so don't let them get too dark). Drain on kitchen paper. To serve, toss the beans in the olive oil and lemon juice and season with salt and pepper. Pile onto a platter (or onto individual plates) and top with the prosciutto and breadcrumbs. Serve with a large dollop of aïoli. How I adore aïoli - was first introduced to it while still in high school, my mom used to whip it up and I thought it was super grand.